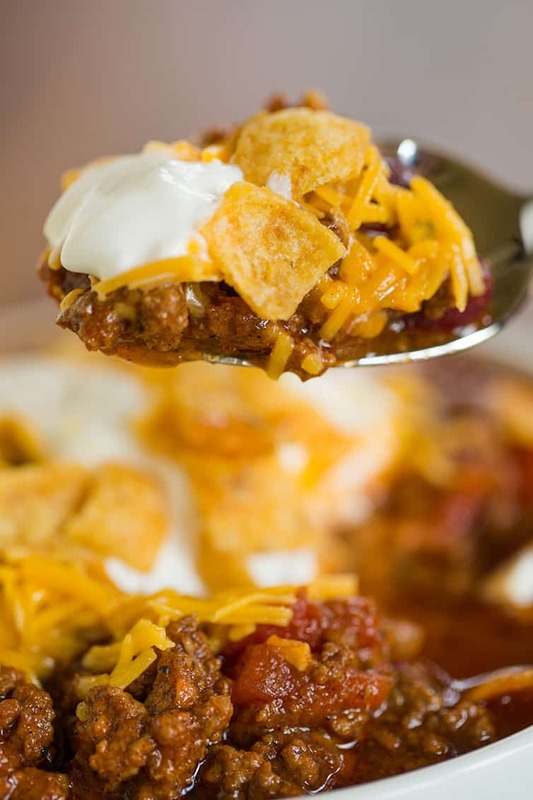 A big bowl of piping hot chili topped with shredded cheese and sour cream (and Fritos, if I’m being perfectly honest) is one of my ultimate cold-weather comfort foods. It’s something that I’ve loved since I was a kid, and I still can’t get enough of it. As you can probably tell based on how many chili recipes there are on this site, I can’t resist trying new chili recipes when I come across them. While I’ve tried quite a few classic-style beef chili recipes, I still hadn’t managed to fine “the one” until a few years ago. Once I made this recipe, the search was officially over; it is, hands-down, the best chili recipe I’ve ever made. It is worthy of lamination and a permanent home in any recipe collection. So, How Do You Make the Best Chili? Most homemade chili recipes are made up of the same basic ingredients: ground beef, onion, spices, beans and some type of tomato product. The differences usually reside in the quantities used, how the dish is cooked, and for how long. 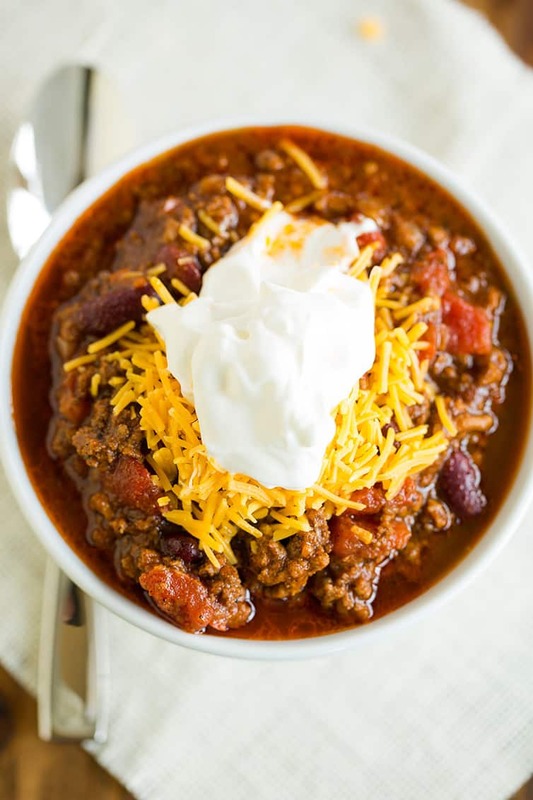 This recipe strikes the perfect balance of textures, flavors and spice; the resulting chili is thick and tender, not soupy, and a phenomenal blend of flavors. I urge you not to rush the cooking process. The wait is definitely worth it! Can you make this in the crock pot? You can, although the texture may not turn out exactly the same. I would recommend completing the recipe through most of step #2, and instead of simmering on the stove, transfer to a crock pot and cook on low for 6 to 8 hours or high for 3 to 4 hours. When cooking on the stovetop, that last step of removing the lid and simmering for 45 minutes really gives the chili its thick texture. You may want to make sure you leave the lid ajar and cook on high for an hour if you’re using a crock pot to try to mimic the texture. Can you make this without beans? Yes! I love them, but there are many chili recipes out there that don’t use them (I’m looking at you, Texas!) and you can easily omit them from this recipe without an issue. Can I use different beans? I think kidney beans are the best since they’re heart and stand up well to the cooking and other ingredients. You could substitute black beans or pinto beans, but white beans will break down too much. I know that I’ll likely get asked which of the chili recipes I’ve shared on the site to date is my favorite. If you’re looking for an easy, classic beef chili recipe, this one is a must-make. It’s my favorite of the bunch, and it also freezes really well. That being said, I also really love the chili con carne recipe. It’s quite a different recipe, with varying flavors and textures, so if you want to try a chili recipe with a unique flair, I highly recommend that one. 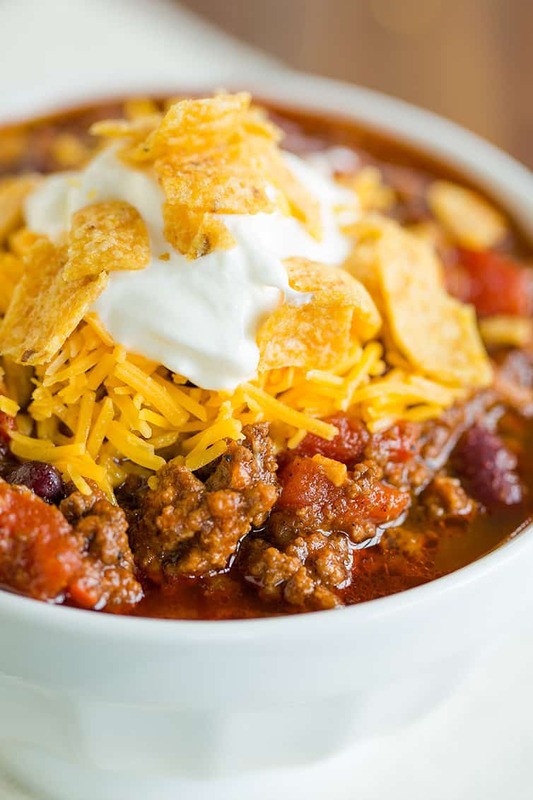 If you crave warm bowls of comfort food during the fall and winter months, this chili has your name all over it! Eat it in a bowl with your favorite toppings or spoon it over hot dogs, nachos, or build a Frito pie! This classic chili recipe is extremely easy, does not require any fancy ingredients, and freezes exceptionally well. Perfect cold-weather comfort food! Heat the oil in a large Dutch oven over medium heat until it is shimmering. Add the onions, bell pepper, chili powder, cumin, cayenne and ½ teaspoon of the salt. Cook until the vegetables have softened, about 7 minutes. Stir in the garlic and cook for another 30 seconds. Remove the lid and continue to simmer for an additional 45 minutes. Season with additional salt and pepper to taste before serving. Garnish with shredded cheddar cheese and sour cream, if desired. 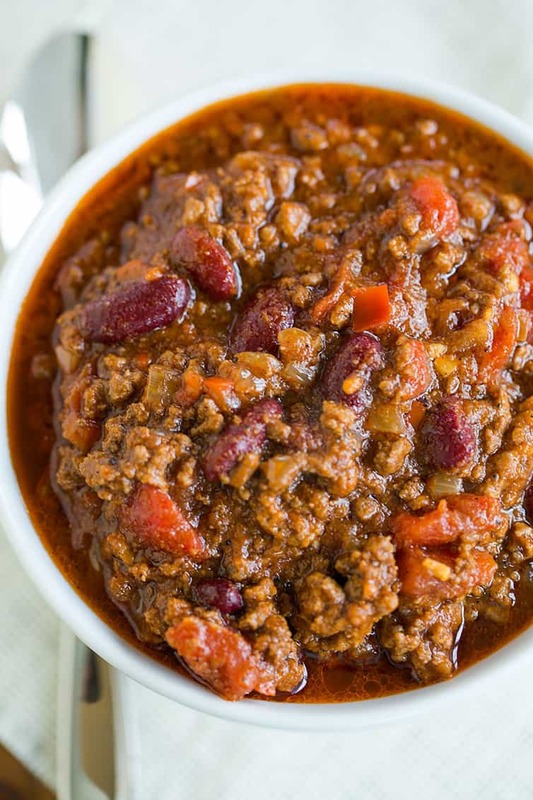 Leftover chili can be stored in an airtight container in the refrigerator for up to 4 days. The chili can also be frozen for up to 1 month (let the chili thaw in refrigerator for 24 hours before reheating). To make in the slow cooker, prepare through step #2 up until simmering, then transfer to a slow cooker and cook on low for 6 to 8 hours or on high for 3 to 4 hours. Leave the lid ajar and cook on high for the final hour of cooking to allow the chili to thicken. You can omit the beans if you choose. This recipe was originally published in January 2013. It was updated in September 2017 with new photos and refreshed in September 2018 with additional recipe notes. So hearty and delicious. My family loves this chili! I love this chili! Perfect for winter! I’ve been making this chili exclusively for the past year and I have no desire to try any other recipe. I use ground elk every time as we do not eat conventional beef and it’s so good! It’s easy to have all the ingredients on hand, too. Winner winner chili for dinner! Gonna try this because I love chili but can not figure out the seasoning well enough. One thing I have noted, when either pressure cooking or slow cooking, I find my seasoning to be a little flat. So I will add or reserve some seasoning for the end. In this case, a little cayenne or some Louisian hot sauce after the slow cook or before serving might help balance the spice pack. Just a thought. BTW how are the ‘guins looking this year? How crucial is the tomato puree to this recipe? I have all the ingredients on hand except tomato puree. I do, however, have crushed tomatoes. Would those work? Good question. When I have used crushed instead of puree, I find the tomato flavor to stronger. Not a bad thing but it can hide some of the spices so you taste the tomato…..then the heat. Sneaky way to wake up the buds. This was incredible and I’m totally a beginner cook! This is literally the best chili I’ve ever had! Absolutely the best chili I have ever made or tasted. I love the technique of cooking the meat in the softened veggies and spices. That makes this recipe. When you bite into the meat (I used ground turkey) you get a wonderful burst of flavor! Super recipe! This is the best chili recipe. So good and filling! Best chili recipe ever. I’ve been using it for years now! Still going strong in 2018!! If you can’t find extra lean ground beef, would you suggest browning the beef first and draining the fat ? Hi Mike, 85-90% isn’t super lean (I think the 93-96% stuff is super lean), but if you go down to 80% or lower, you may want to drain. If Im wanting to make double the serving would I just double all the ingredients? Wow!! I finally found a chili recipe that comes out the way it says it will! This is my new favorite chili. I followed the recipe and directions and it turned out perfect. I was skeptical about not draining the beef, but using 89% lean didn’t leave much fat in the pan and once everything was added and simmered it cooked down anyway. The flavor is perfect. Just enough heat so everyone enjoyed it. The best part was the texture. Nice and thick. We served it with Fritos Scoops. Absolutely great chili. Will be making this a lot over Fall and Winter. Thanks for sharing! My husband is enjoying this as I type and he said to thank you from him. Looks so fresh and crunchy and creamy all at once. Another winning recipe from browneyedbaker !! What size crock pot is this recipe for? Would this fit in a 4.5 quart? Hi Emma, This is not a crock pot recipe; it is meant to be made on the stovetop. I don’t know how I missed that… Do you think it could still be done in a crockpot, aside from browning the beef? Hi Emma, Cooking it on the stovetop, especially the last part when it is uncovered, really helps for it to cook down and thicken. You could still do it in the crock pot, just know that the texture will end up being different. Chili and cornbread on a winter’s night is pure comfort food, and this is just about identical to my own recipe, so I didn’t have to make it to know the flavor must be good. That being said, though, the chili looks very greasy in the posted pictures. I would strongly suggest *not* sauteing the vegetables in oil, but with the ground meat. While browning, the meat will give off some grease of its own, so after it’s browned and the vegetables are soft, place the whole mixture in a colander and rinse it off with cold water to remove all that excess grease. Put the mixture back in the cooking pot and add the amounts of chili powder and cumin to taste so the chili is mild enough or hot enough to best suit your and your family’s taste. Hope this helps! Hi Deborah, I don’t find this chili to be greasy, but if you are worried about it, I would simply recommend using extra lean ground beef instead of rinsing it – you would lose SO much flavor doing that! I always use ground sirloin for chili and rinse it to remove any excess grease *before* adding the spices. It makes a world of difference and, since the spices are added *after* returning the meat to the cooking pot, you still get all the full flavor of the chili. That wouldn’t work with this recipe since the vegetables and spices are cooked together, and then with the beef, but even if they were added after, I just can’t imagine rinsing cooked beef! Thanks for sharing Beth! And I’m so glad it’s been a hit! I made this today in my Instant Pot. I sautéed the beef in the pot. I added the rest of the ingredients, put the lid on, pressed the chili/bean button and walked away. When the 30 minute cook time was up, I let the pressure release on its own instead of using the quick release since I was in no hurry. It was really good and my family loved it! Sounds perfect for a January day in Maine with wind chills of -25! I’m going to follow all the pre-cooking instructions and then throw it all in my Crock-Pot on low for 4 hours. Does this sound like a good idea? Hi Cynthia, I’ve never made this in the slow cooker, so I couldn’t say for sure, but during that last 45 minutes it does cook uncovered so a good bit of the liquid evaporates and it thickens, which may not happen in a covered slow cooker. How do I find the nutritional value for this recipe? I’m tracking calories. Thank you! Hi Laurie, I don’t calculate nutritional info because there are so many varying factors (brands, servings, etc.) but there are tons of sites out there that will let you do it for free… I know for sure MyFitnessPal. Just made this tonight on a frigid Illinois winter day (2 degrees!). I used ground turkey and pureed 2 cans of diced tomatoes (instead of using the tomato puree) and it turned out excellent. We especially loved it with Cholula Chipotle Hot Sauce – yum! Thanks for another great recipe, BEB!! I made this tonight and it was delicious! I added an extra bell pepper and three jalapenos because I wanted more texture and spiciness. It turned out great. Thanks for the great recipe! Love this chil. reminds me of what my family made when I was growing up. I add in jalapeños and use fewer beans since my husband doesn’t like too many. I lie that there are no complicated steps or crazy ingredients like in some other chili recipes. Just stumbled upon this recipe, made it over the weekend and LOVED it. Simple, easy, thick and tasty. I changed nothing other than using half the cayenne pepper. After I sauteed the pepper, onions, etc. and browned the meat, I put it all in the crockpot and it was soooooooooooo good!! This must be a mistake, “1 (28-ounce) can tomato puree”? Isn’t tomato puree the same as tomato paste? No, tomato puree is like a thick sauce; tomato paste is, well, a paste that comes in very small cans or tubes. Hi Madro, No, not a mistake, one 28-ounce can of tomato puree is correct. So, i just made this last night for a chili cook-off at work…. Lets just say i won 1st place. It was the only pot that was scraped clean. Oh my gosh that’s awesome!! Love it! This recipe was both easy and delicious. It will now be my go to recipe for chili.